In the earliest days of the porter – and the brown ales from which it was born in London in the 18th century – there would be occasions when the beers would be smoky. The cheapest form of brown malt available at the time was smoked so, while many brewers avoided it and used "cleaner", more expensive malts, there were smoked porters. It's a style within a style that has gained some popularity since American craft brewers brought the porter back from near extinction. 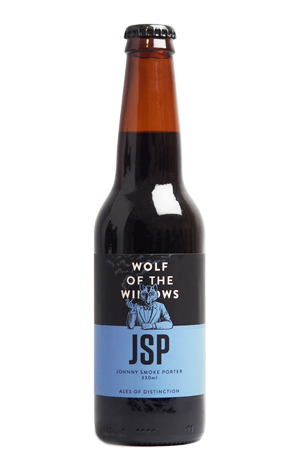 For Wolf of the Willows' take on the smoked porter, the Johnny Smoked Porter (JSP), they used a touch of rauch malt from Germany alongside various other dark malts to create layers of sweetness, smoke and more espresso like characters. In another nod to the beer's ancestors, they used English East Kent Goldings and Willamette hops to add a gentle, earthy bitterness to assist in creating the beer's dry finish.